Ronin is pretty much my favorite restaurant. I’m crazy for their seaweed salad, dragon roll, and their kobe beef mini burgers served with a mountain of shoe-string fries. So when they put beer in marshmallows, I knew it had to be good. I believe it was their November dessert special: guinness marshmallow s’mores with homemade graham crackers and dark chocolate ganache. Since it was a “limited time only” kind of thing, Jake and I totally ordered dessert despite being full to the brim. … and it was amazing! Of course! 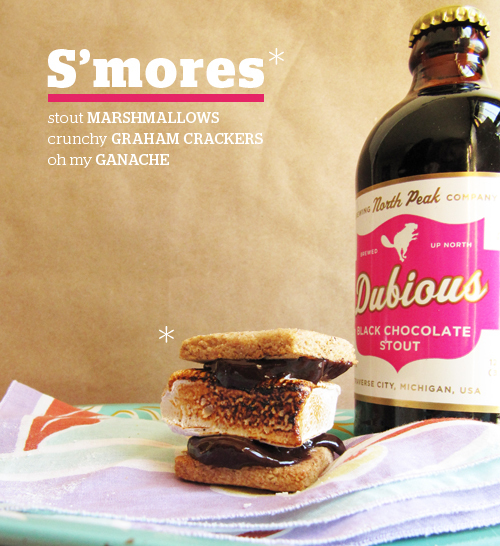 So I knew when November was over I’d still need these s’mores in my life. While I didn’t use Guinness in my version, I used a super dark stout: black chocolate stout to be exact. Sometimes I choose beer based on how pretty the packaging is. And this beer is as tasty as it is pretty. 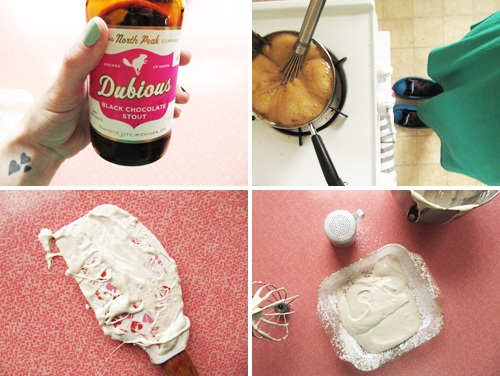 * Pour 1/2 cup of beer into a dish and set in the fridge over night, or whisk vigorously to remove carbonation. Spray and 8 inch square dish with pam and generously sprinkle it with powdered sugar to cover and coat. Set aside. In the bowl of your stand mixer pour gelatin over 1/4 cup of beer. Set aside to bloom. In a saucepan combine sugar, remaining 1/4 cup beer, syrup, and salt. Heat over low heat and whisk until sugar is dissolved, about 3-5 minutes. Turn heat up to medium and let sugar come to a boil. Let it boil for 8-12 minutes or until it reaches 240 F on your candy thermometer. Turn off heat and pour over gelatin mixture in your mixer. Using the whisk attachment beat for 6-8 minutes. It should grow in size and be white and fluffy. About 3-4 minutes in, beat the egg white in a separate bowl until stiff peaks form. Add beaten egg white and vanilla to the marshmallow mixture and beat until just combined. Pour marshmallow mixture into the prepared pan. Smooth with a greased spatula. 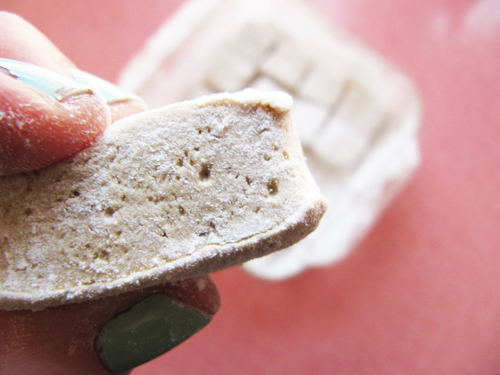 Dust with the top with powdered sugar and let sit to firm up, uncovered, for 3-5 hours or overnight. 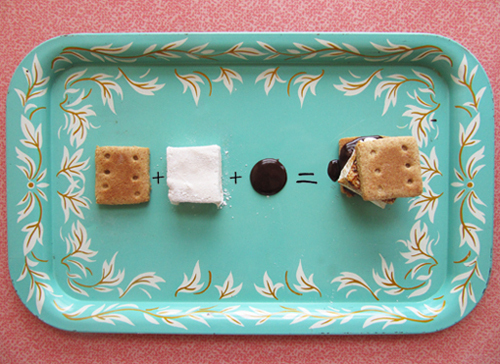 Once firm, turn the pan upside down on a cutting board to release the marshmallow. Cut into pieces of your dreams. Please Note: I halved the original recipe; feel free to double the recipe above for marshmallows galore! 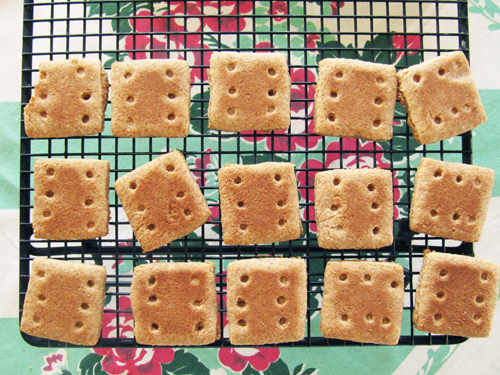 I’ve made these graham crackers before. I loved them then and sure do now! Fannie Farmer isn’t messing around when she says how to make these little squares of heaven. These do make a few extra, but they are perfect for dunking in milk (or coffee) and are just the perfect snack attack. P.S. I cut mine out with a 1 1/2 inch cookie cutter since I’ve never been able to even draw a straight line, much less, cut out a nice square. Combine the butter, egg and sugar in a medium bowl, and beat until smooth and creamy. Stir in the honey and blend. Dissolve the baking soda in the water and add to the butter mixture. Add the salt, graham flour and all purpose flour to the mixture and blend thoroughly. The dough should hold together and be manageable. 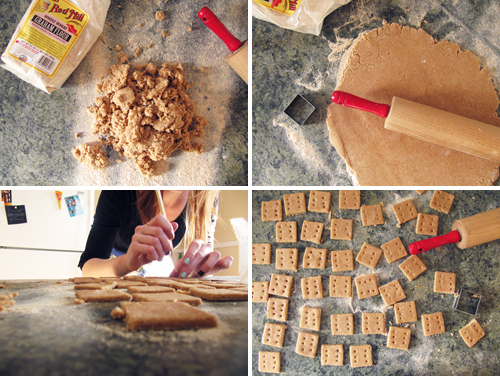 Using a spatula, place the cracker squares onto the prepared baking sheets. Poke with a fork or with a chopstick creating a fun pattern. Bake on the first side for 5 minutes, then turn the crackers over and bake for 5 minutes. Remove from the oven and cool on racks. Don’t judge their tan lines. I’d like to surf on that ganache and then eat it for dinner. Heat cream in a saucepan over medium heat until warm. Bubbles will start forming around the edges. Pour over chopped chocolate and let sit for 1 minute. Whisk until smooth. Allow to come to room temperature, and chill a bit if you’d like it even thicker. If it gets too thick to function warm it in the microwave at 10 second intervals, and stir until softened to your liking. 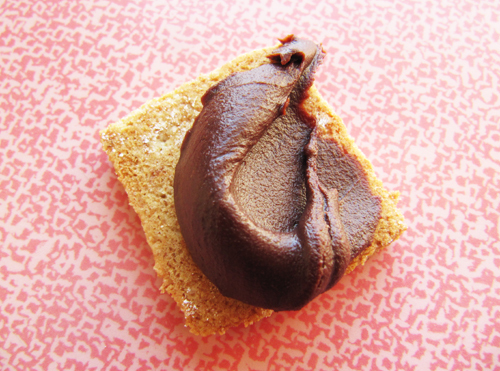 Assembly: Place a teaspoon of ganache on a graham cracker. Top with a toasted marshmallow. Top with additional ganache another graham cracker. Enjoy three at least! Oh my gosh!! This sounds & looks so good! I’d make it myself right now if I didn’t have a broken leg! How about a little S’mores care package?? 😉 wink 😉 wink!! OMG. These look so incredibly delicious! Whoa! 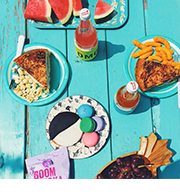 These sound delightful! I’m not a beer drinker, but I fully appreciate the North Peak beer packaging and have a diabolical t-shirt I picked up in TC at the Jolly Pumpkin. Marc loves the beer, though. I’ve never seen the pretty pink one before. Have a wonderful birthday! Oooh and Nicole this beer tastes like dark chocolate. It’s a Beer-acle! I love this! I want those kobe burgers again, nowish…happy belated bday btw! 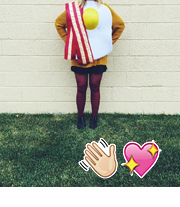 Also, this new blog design just makes me smile…sometimes being indecisive pays off! Yay! Thanks! And yeah man. Indecision! Who knew? Happy St. Patrick’s Day Eve!